The National Citizens Alliance (NCA) believes that public service for an elected official should never be motivated by financial gain. Therefore, the NCA is committed to eliminating the financial incentives to run for public office. *The Prime Minister, Speaker of the House, Leader of the Opposition and Cabinet Ministers also get a car allowance. The National Citizens Alliance supports reducing all the salaries across the board down closer to the average salary of the Canadian worker at approximately $90,000 per year or the average salary over a five year period a particular MP earned prior to entering office. This base salary would apply to all elected officials irrespective of their position in government. Currently as shown above, the average salary of MPs is $167,400 per year. 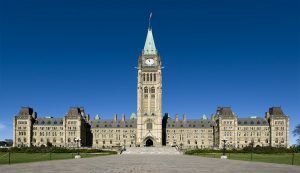 In addition, the National Citizens Alliance supports reducing all pensions for elected officials regardless of their position in government closer to that of the average retirement pension of the Canadian people: approximately $50,000 per year for life after serving two full terms. These pensions would kick in once the MP reaches the legal requirement age, and they would be retroactive. Currently, most federal elected officials get approximately $100,000 per year for life, while elected officials in senior positions get significantly more like the Prime Minister, who gets close $500,000 for life after serving just 1 term. The Reduction in Salaries and Pensions of Elected Officials policy statement requires a vote of the NCA membership to be adopted. A minimum 70 percent voting membership must support the policy and with a 50 percent quorum of voting membership as per the NCA Constitution (2014).